The idea of getting married while floating in zero gravity is not really typical of what little girls dream of when imagining their wedding day. 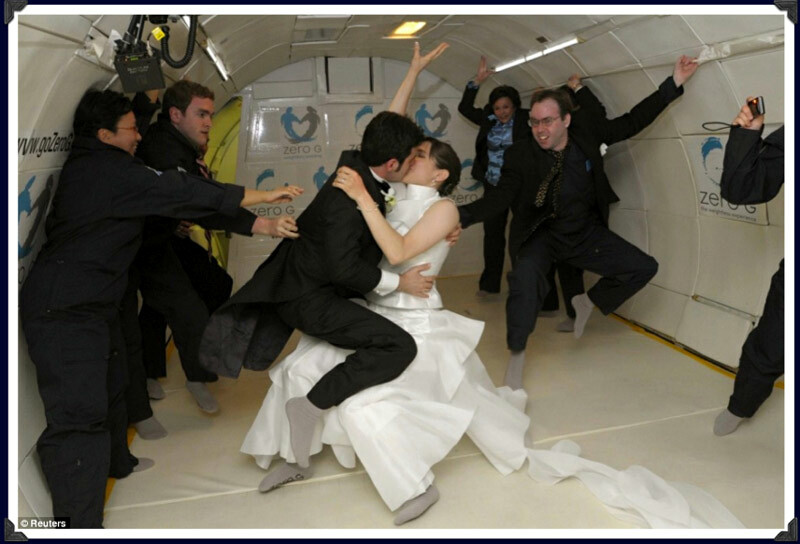 But love was in the air for Noah Fulmor and Erin Finnegan who became the first couple to say "I do" floating in zero gravity on June 20, 2009, as they launched into a weightless first kiss that was out of this world. The couple tied the knot on a special flight used to simulate the zero gravity experienced by astronauts on space walks. Noah, 31, and Erin, 30, from new York, paid more than £10,000 to have their wedding in a converted Boeing 727 just to say "I do". They exchanged rings they had made from precious metal fragments of a meteorite that crashed to Earth in Namibia 30,000 years ago. Erin said: "Noah wanted to get married in space but we probably won't be able to afford it for another 25 to 50 years - so I suggested this as a compromise." Most of us know that walking down the aisle into a lifetime commitment can be stressful enough without adding weightlessness to the equation. This zero gravity flight, lasting 90 minutes, made 16 roller coaster type dives, known as parabolic arcs, in order to create the weightlessness inside the cabin. Hows that for living on the edge? "The physics of the first kiss were off," Noah told Reuters. "I could feel where I was going, I knew where I needed to be, but it was hard to reconcile the differences." "Noah knocked into my nose and I thought it would bleed," Erin said. We wish Noah and Erin many years of happiness together and plenty of great grounded kisses since their return to the normal gravity back on earth. A place where the best kisses are seldom misses. "I've waited my whole life for this ... what I remember most was the feeling of weightlessness, both physically and emotionally," Noah Fulmor told Reuters. This had to be cool! CONGRATULATIONS!!! best wishes!